Can Romney Win without Ohio? Ohio has successfully chosen the presidential winner in every election since 1960 and no Republican has ever won the White House without first winning the buckeye state. In the upcoming election, it is generally believed that Ohio is the linchpin to electoral victory once again. From the bastions of liberal thought at the New York Times to the conservative beacon, The Weekly Standard, it is almost universally agreed that Ohio is about as “must-win” as a state can get. This is not just a reflection of Ohio’s crucial 18 electoral votes or Ohio’s past position as historical predictor, but also an understanding that Ohio is a microcosm of America. 14.1% of Ohio’s population is over 65; 13% nationally are seniors. Ohio is 22.6% rural; the nation is 21%. 12.2% of Ohio’s citizens are black compared to 12.6% across the country. Even when Ohio’s demographics diverge from the country, there remains a tendency toward political balance – Ohio, for example, has a smaller Hispanic population than the national average but a larger number of union households. In short, the conventional wisdom goes, if you can’t appeal to Ohio voters, you can’t appeal to American voters. In light of President Obama’s declining national poll numbers since the first debate, many Democrats have been referencing Obama’s “Midwest Firewall” – a belief that the president has not lost as much ground in the Midwest as he has nationally and that this will allow an electoral victory come November. Essentially, the Obama campaign is banking on holding Ohio. The conventional wisdom is usually correct – that’s why it is conventional. But is it possible Ohio is not the key to electoral victory for Romney? After all, no Democrat had won the White House without Missouri, until President Obama did in 2008. Before I examine some reasons why Ohio’s importance may be overstated, a caveat is in order. Winning Ohio is the likeliest route to victory for either candidate. The point of this exercise is to demonstrate that Ohio is neither necessary for a Romney victory, nor sufficient for an Obama win. And due to some idiosyncrasies particular to this election battle, Ohio is not quite as important as elections past. 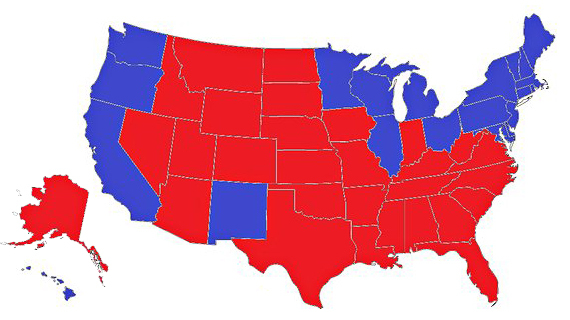 Romney’s Ohio-less electoral college map assumes a win in Virginia, Florida, North Carolina, Indiana and all of the McCain states – without any of these states, there is no GOP path to victory (Romney is leading (or tied) in an average of polling in each of these states, so this assumption is not unreasonable). This analysis focuses on five states: Colorado, Nevada, Wisconsin, Iowa and New Hampshire. In each state Romney is within three points of the President in an average of polling and in each state there is reason to suspect that Romney may have built-in advantages that are not present in Ohio and potentially not captured by the polls. Keep in mind that Romney need not win all five of these states. Feel free to examine the electoral math combinations yourself, but essentially it boils down to Romney needing three of these five battlegrounds. Below is an example of one such Romney victory. This map has Romney winning Colorado, Nevada and Iowa and would lead to a 269 to 269 electoral tie (that would then proceed to the US house and most likely a Romney victory). In order for this to occur Romney needs to perform 2.4 points better in Iowa than an average of current polls, 3 points better in Nevada and maintain his small lead in Colorado. No small feat, to be sure, but far from an impossibility. These states, furthermore, have received far less attention than all-important Ohio. Since October 8th, Nevada has been polled four times by major polling outfits – in the same period there have been ten polls of Ohio. Less polling necessarily means a greater likelihood that the polls fail to accurately capture voter’s preferences. In this sense, a 2.2-point deficit in ten Ohio polls is more difficult for Romney to overcome than a 3-point deficit in just four Nevada polls. On top of that, these five states have certain idiosyncrasies that may give Romney an advantage. Nevada, for instance, has a 7% Mormon population. Obviously this group is likely to support Mitt Romney – but this support may not be accurately seen in polling data. The first Mormon presidential candidate is likely to boost the Mormon vote to historic highs not unlike the first African American candidate boosted black turnout; this boost is not captured in polls that are weighed by racial makeup (as most polls are) because they assume a similar racial breakdown as 2008 (or possibly 2004). A boost to the Mormon vote, however, should mean a proportional boost to the white vote and a corresponding boost to Romney’s numbers. One could make similar arguments for Wisconsin where recall battles have soured the Democratic support among Independents (who correspondingly don’t want to answer polls) and native-son Paul Ryan may boost turnout. For New Hampshire, where Mitt Romney occasionally hails from and where a fellow New Englander may have more influence on late deciders. For Iowa, where a drop in enthusiasm among college aged voters and support among white women is likely to be more dramatic than other states. And for Colorado, where a ballot measure to legalize medical marijuana may increase conservative turnout in opposition (as has occurred with other similar measures in the past). None of these are certain to flip a state. But keep in mind that all of these states are already close; small shifts in voting patterns or alterations to the electorate could make a big difference to the final winner. Finally, there is something unusual about Ohio itself this cycle – namely its economy has shown far more improvement during the Obama Presidency than any other swing state. From 2009 to today, Ohio’s unemployment rate dropped from 10.1% to 7% – a staggering 3% drop that has not been experienced across the country. Wisconsin, Colorado, Iowa and New Hampshire all saw much meager unemployment declines of between 1.4% and .5% and Nevada actually has seen a small unemployment increase to 11.8%. In light of these numbers, it is unsurprising that Ohio is slightly more bullish on an Obama second term than the nation as a whole. It also means that Mitt Romney has an opportunity to collect that all important 270th electoral vote from outside the buckeye state. Tags: 2012 election, Electoral College, Mitt Romney, Ohio, President Obama. Bookmark the permalink.